The Great Louvre Picture Cleaning Controversy has crossed the Atlantic. Following the Guardian coverage reported in our previous post, the New York Times’ Paris Correspondent, Elaine Sciolino, today covers yesterday’s meeting (January 3rd) of the Louvre’s international advisory committee on the restoration of Leonardo’s “Virgin and Child with St Anne”. Ms Sciolino’s account likens the current internal professional crisis of confidence at the Louvre to the controversy over cleaning methods that followed in the wake of the restoration of Michelangelo’s Sistine Chapel ceiling frescoes in the late 1980s and the 1990s. The departure from the Louvre’s advisory committee of two such eminent authorities as Ségolène Bergeon Langle, the former director of conservation for the Louvre and France’s national museums, and Jean-Pierre Cuzin, the former director of paintings at the Louvre, comes at the moment when the “Virgin and Child with St Anne” enters its second and (– as we have seen with the repainted angel’s face in the National Gallery’s version of Leonardo’s “The Virgin of the Rocks”) inherently perilous phase of retouching. Louvre spokesmen, in their official justifications for a provocatively radical and inescapably controversial cleaning, are seemingly in denial of the significance of the events now reverberating around their heads. Madame Bergeon Langle’s timely and sagacious warning that “Despite great progress in our competence we need to be driven by modesty. Better and more controllable materials are yet to be discovered” can only give heart to those critics who have been horrified by the Gadarene Scramble for newsworthy restorations in which too many major museums and galleries have already participated. Above: the Louvre’s (unfinished, c. 1508-10) Leonardo da Vinci “The Virgin and Child with St Anne”. 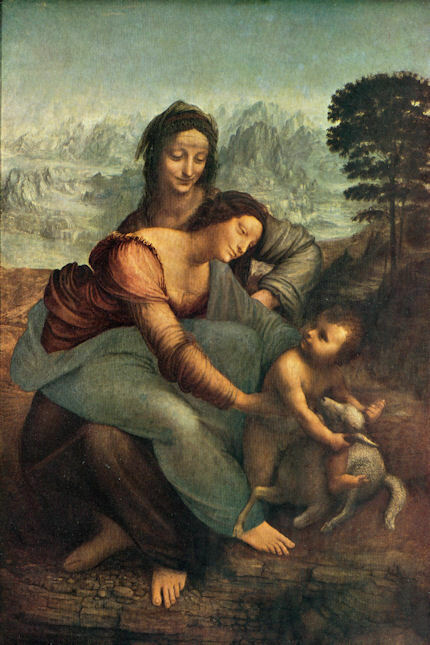 In return for the loan of the Louvre’s version of Leonardo’s “The Virgin of the Rocks”, the National Gallery is to send its (brittle and fragile) Leonardo Cartoon (“The Virgin and Child with St Anne and the Infant St John”) to the Louvre, to accompany the unveiling, after cleaning and restoration, of the “Virgin and Child with St Anne” – so many cross-polinating risks being undertaken by so few, so insouciant, curators. This entry was posted on January 4, 2012. It was filed under blog.